Not everyone needs, wants or has the means to afford a multi-thousand-dollar, professional-caliber fish finder. As a weekend angler, you’ll have to weigh your fishing-technology dollars against the capabilities and features of various units. You may even have to forego some of the more expensive options to stay within your target budget. In fact, the slate of features you desire is one of the most important considerations you’ll make while shopping for a new fish finder. This is because the leading manufacturers usually offer similar features and capabilities at similar price points. For example, CHIRP technology and scanning sonar capabilities are rare among fish finders in the very lowest price categories. Similarly, you’ll rarely find a fish finder with a 7-inch screen, unless you pay significantly more in most cases. By the time you are spending several hundred dollars on a fish finder, you probably have almost all of the features you can reasonably expect in a consumer-level product. This includes CHIRP and scanning sonar, GPS functionality and a large display screen. But when you open up your wallet just a hair farther, you can get the final feature available in mainstream fish finders: side-scanning capabilities. With a fish finder capable of both down-imaging and side-scanning, you can collect a world of data that you’d otherwise miss. There are a few different models that provide these types of capabilities, but the Garmin STRIKER 7sv is one of the best, and earns an A- rating from Fishing Tech. Even though the STRIKER 7sv comes equipped with a variety of cutting-edge technologies, one of its most valuable is the included flasher function. With flasher mode engaged, you’ll be able to block out all of the unnecessary data displayed on the screen, in favor of the information you need while vertically jigging or ice fishing (be sure to purchase the ice-fishing bundle if you plan on primarily using this unit as an ice-fishing tool). The flashing function provided by the 7sv is accurate enough to show you the lake bottom, your target fish and the lure on the end of your line at the same time. In addition to working like a traditional sonar transducer, the STRIKER 7sv also uses CHIRP technology to image things in the water. Unlike traditional sonar units, which rely on only a small number of frequencies, CHIRP-enabled fish finders emit sound waves across a wide variety of frequencies. This provides far more detail than a traditional sonar unit can, although these signals aren’t able to travel quite as deep in the water column as traditional sonar signals can. Sometimes a regular sonar image – even a high-quality CHIRP image – fails to provide quite as much detail as you’d like. At times like these, you want a fish finder that has scanning sonar capabilities. With these, you’ll be able to see nearly photo-quality images of the cover and structure in the water, which will help you find and catch more fish. Like many other members of the Garmin STRIKER lineup, the 7sv includes ClearVu scanning sonar, which collects image data from above. 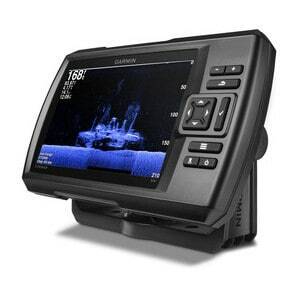 But while most fish finders at lower price points only offer scanning sonars that image what is directly beneath the boat, the Garmin STRIKER 7sv also includes a side-facing scanning sonar, called SideVu. This way, you’ll not only see items of interest that are directly below your boat, but those that are to either side of your boat as well. A fish finder won’t do you any good if you can’t see the information presented on the screen, and no one likes having to squint and shift around while trying to see where the fish are hiding. But these are the kinds of problems STRIKER 7sv users need to worry about. The 7sv’s screen is large and easy-to-see in all weather conditions. Additionally, thanks to the tilt-and-swivel mount, you can point it wherever you like. The STRIKER 7sv collects a lot of data; in fact, it collects more than can be seen on a given screen. However, by engaging the zoomable split-screen function, you can view three different types of data side-by-side. For example, you may want to consult your waypoint map and the CHIRP sonar simultaneously, to help find and mark submerged points or river channels. Most good fish finders are waterproof to some degree, but the Garmin STRIKER 7sv clearly ranks among the best-protected units on the market. Because this fish finder will not only withstand sprayed or splashed water, but submersion for up to 30 minutes in 1-meter-deep water, the 7sv has earned an IPX7 water-resistance rating. This makes the 7sv a great choice for kayakers, for whom an overturned craft is always a possibility. Most high-quality fish finders include a GPS module, and the 7sv is no exception. With this kind of geographic data, you’ll be able to navigate more effectively and locate previously visited hotspots with ease. Additionally, the GPS module of the 7sv also displays your travel speed on the main screen, so you don’t have to take your eyes of the display. When trying to decide on the best fish finder for your needs, it’s often helpful to compare a few different models. This includes others in the same price class, as well as a few comparable fish finders made by competing companies. The STRIKER 7sv is the pinnacle of Garmin’s popular STRIKER series, so if you want a more feature-packed fish finder, yet you want to stick with a Garmin product, you’ll have to look at the echoMAP Chirp 72scv. This unit provides all of the primary capabilities and functions as the STRIKER 7sv, and it also provides you with chart-plotting capabilities. However, you’ll pay almost a couple hundred dollars more for the ability to do so, so comparing two units with such disparate price points is difficult at best. If you’d prefer a slightly more affordable Garmin product, you could try out the STRIKER 7cv. This fish finder, which is a bit cheaper than the 7sv provides all of the capabilities that the 7sv does, except that it is not capable of side-scanning. Read our Garmin STRIKER 7cv review. Two products that are relatively similar to the Garmin STRIKER 7sv include the Humminbird Helix 7 Chirp Si Gps G2 and the Lowrance Elite-7 ti. Both units provide the same basic features and capabilities that the Garmin 7sv does, including GPS functionality, CHIRP technology and side-imaging sonar. However, the STRIKER 7sv enjoys a price point that is about a bit lower (depending on the retailer) than those of the Humminbird or Lowrance fish finders. Nevertheless, both the HELIX and the Elite-7 provide chart-plotting functionality, which is a significant feature that should not be overlooked. Aside from this, the Elite-7 features a touch-screen interface, which may appeal to some anglers. Read our Humminbird HELIX 7 review and our Lowrance Elite-7 review. The Garmin STRIKER 7sv is probably a little more fish finder than some anglers need, but serious anglers will likely find that the Garmin STRIKER 7sv is a fantastic choice. It has all of the features you’d want in a fish finder except chart-plotting capabilities, and the side-imaging functionality will provide a wealth of information that will help you find the fish more effectively. Additionally, most anglers find the STRIKER 7sv’s user interface intuitive and easy to use. Accordingly, Fishing Tech rates the STRIKER 7sv as an A-.